A couple weeks ago I was on a flight to New York City. It was then that I was served a gourmet extra-soft white chocolate lime cookie... sounds good doesn't it? And to be honest, it was quite good. The thing that disturbed me though, was the label that was on the cookie's packaging. 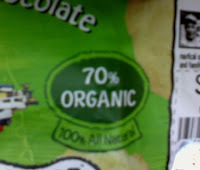 70% Organic... seriously? What is the basis for my comparison? What other semi-organic product do I know of? Is this supposed to make the cookie more enticing to health nuts? What percentage of a standard non-organic product is actually organic anyway? There's a lot to think about here:P The thing is, there's been so much much focus lately on making things "green", that people really are starting to lose the point. I don't want to delve into the details of how the "green" push has affected consumerism in general, because enough people have already done that. I just wanted to point out something small and ridiculous because it's a lot easier to do so. Posted by Zakir Hemraj at 9:28 p.m.